Lock in a great price for La Croix Blanche – rated 8.2 by recent guests! Great location! Centrally located with parking for car. Easy access for skiing . Located close to great restaurants and shopping. Staff was very helpful in answering questions on local area attractions and updates on current weather conditios for skiing or mountain pass road closures. This hotel was located in the center of town and very easy to find. The staff was very helpful and kind. The room was spacious and comfortable and we loved the vintage charm and style. It was a great value for the money. The restaurant that is attached has very good food as well. I had the best french onion soup I have ever had! While the location was very central and everything was within walking distance, it was difficult to locate the property the first time. I stayed in the bed rather late almost every morning. Yet, my room was cleaned up everyday when I got back in the afternoon. Also the noise from morning cleaning frenzy in neighboring room was quite OK. Far better than what I've experienced in other hotels. Quite fridge was great! Location was awesome! Great walking distance to everything in Chamonix. Also Alex, who checked us in, was extremely helpful with insights into the city, directions, and recommendations. Huge family room with the most amazing view of Mont Blanc! Breakfast looked good though we didn’t try it. Staff was superb. Excellent location. And there was parking. 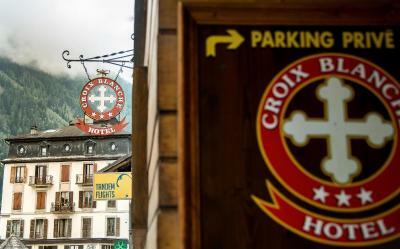 One of our top picks in Chamonix.La Croix Blanche is set in a building dating from 1783 in the center of Chamonix, within walking-distance to the ski elevators, restaurants and shops. It provides chalet-style accommodations with satellite TV and ski lockers. Ski equipment hire is available at the hotel's ski shop. Guest rooms are equipped with a mini-bar and an private bathroom with a hairdryer. Some rooms offer a balcony with a view of Mont Blanc. La Croix Blanche provides a daily buffet breakfast which can be taken in the dining area or in guests’ rooms. The hotel’s restaurant serves regional specialties including Savoyard cuisine, which can be enjoyed on the terrace facing Mont Blanc. Chamonix Mont-Blanc Train Station is 0.7 mi away. Chamonix City Centre is a great choice for travelers interested in downhill skiing, nature and scenery. 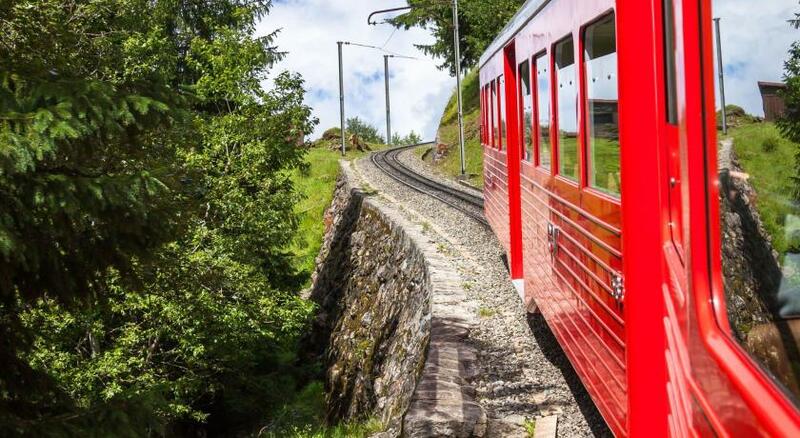 This is our guests' favorite part of Chamonix, according to independent reviews. 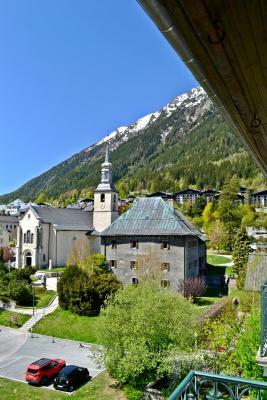 This property also has one of the top-rated locations in Chamonix! Guests are happier about it compared to other properties in the area. When would you like to stay at La Croix Blanche? Offering an private bathroom with a hairdryer and shower, this room is equipped with a mini-bar and satellite TV. Please note that this room is not serviced by an elevator. Private parking is available on site (reservation is needed) and costs EUR 20 per day. This room offers satellite TV and a mini-bar. The private bathroom features a hairdryer and a shower. Located on the garden side of the hotel, this room is serviced by a elevator and is equipped with satellite TV and a mini-bar. Please note that this room cannot accommodate an extra bed. This more spacious twin room is equipped with a mini-bar and satellite TV. This room is equipped with satellite TV and a mini-bar and has an private bathroom with a hairdryer. This spacious suite features a balcony and a seating area. This suite has a balcony and offers a panoramic view of Mont Blanc and the surrounding mountains. A seating area with satellite TV is offered in the room and complimentary toiletries are available in the bathroom. Hotel surroundings – This neighborhood is a great choice for travelers interested in downhill skiing, nature and scenery – Check location Excellent location – show map Guests loved walking around the neighborhood! House Rules La Croix Blanche takes special requests – add in the next step! La Croix Blanche accepts these cards and reserves the right to temporarily hold an amount prior to arrival. there was no elevator. wifi doen't work very well in the room. matress was very bad. Location was just great! and the people of the hotel is very kind and lovely. The hotel has an old-fashioned charm but it could do with refurbishment in some areas and improvement in the WiFi in the bedrooms. Having an elevator would be good. Temperature control. The view from the room is really good. The staffs are friendly. It's not value for money. It's not well maintenance. Central location. The girl from the afternoon duty was very friendly and helpful, instead of a man of the morning duty. Location is incredible, staff very welcoming and very helpful. I had an issue with my ski equipment as couldn't return them because store was closed. They volunteered to keep it at hotel until staff of ski shop came to pick up. Location, value for money, cleanliness. Hotel is tired- needs a face lift. Tiles missing on walls in bathroom. But we only wanted somewhere to sleep so didn’t bother us. 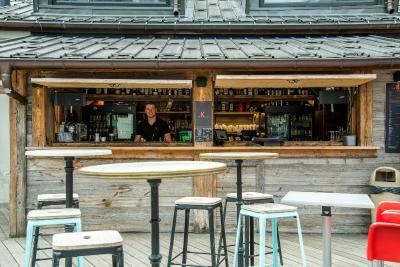 Central location- easy access to shops restaurants, great outside bar for après ski. Easy to get to buses and brevent ski lift. . Bedsheets spotless. Reception really helpful. The hotel is VERY tired (reflected in the price). I’m sure much of the room hasn’t been updated since the early 1970’s. Bathroom has mould everywhere and the furnishings are really old fashioned. Worst thing though are the creaky floorboards. We had people on the floor above us that insisted on walking around the creaky floor from 05:30 for two hours!! Bed was really comfy, staff were friendly and helpful. No noise from outside. Room was warm and spacious. Showers were hot with good flow. Even though it’s old fashioned, the room and linen was very clean. Great location with parking. I have stayed here before and will stay again. It is a great location in the centre of town. Lovely view from the balcony. Staff as always helpful and friendly. It is comfortable, clean and cosy, typical for an old French hotel. Ideal decking area outside the bar for sitting enjoying the sun in lovely surroundings. the hotel needs refurbishment, really. I knew before that it needs it. Next time I know what I expect. Generally it''s function of value vs price and that is ok.